Properly functioning culture systems can assist in determining the basic mechanisms by which dietary lipid modifies the processes of tumor development. However, in vitro technologies must be used with caution. They can give misleading results, particularly with epithelioid cell types. Recent advances in techniques for culture of epithelium greatly extend the usefulness of the cell-culture approach for studies of diet effects. 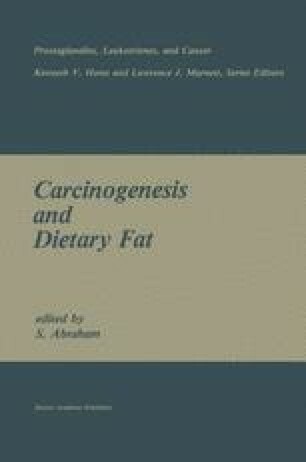 This chapter will focus on improved methods for culture of mammary epithelium, a tissue in which carcinogenesis is strongly influenced by dietary lipids. I will mostly discuss primary cultures, i.e., cultures prepared using cells removed directly from animals. Permanent cell lines are easier to work with, and some lines like the MCF-7 line are very well characterized (1, 2). However, when dealing with a complex problem like dietary lipid effects it is necessary that cells retain all the pertinent features and responses that characterized them in vivo. This is more likely with freshly-prepared cells than with lines that have evolved to survive under artificial conditions in culture.